General Knowledge Questions for RRB ALP: In this post we are giving the most important General Knowledge Question and answers previous year asked in the Railway Recruitment Board Assistant Loco Pilot Examination. 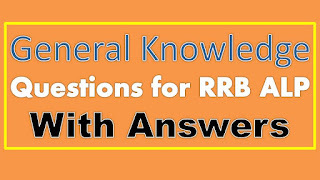 Here we provided the GK Question with answers. These questions are helpful for your preparation for Railway ALP Job Notification 2017-18. And also we give the RRB Assistant Loco Pilot Previous year model question paper and Railway ALP Syllabus 2017. All links are attached below the links download the links free of cost. 1. Digital photos and scanned images are typically stored as … graphics with extensions such as .bmp, .png, .jpg, .tif, or .gif. 4. Where did the Tebhaga Movement occur in 1946? 5. Which one of the following is correctly matched? 6. Which was the first capital of Magadha? 7. Which of the following States of India does not have common border with Myanmar?